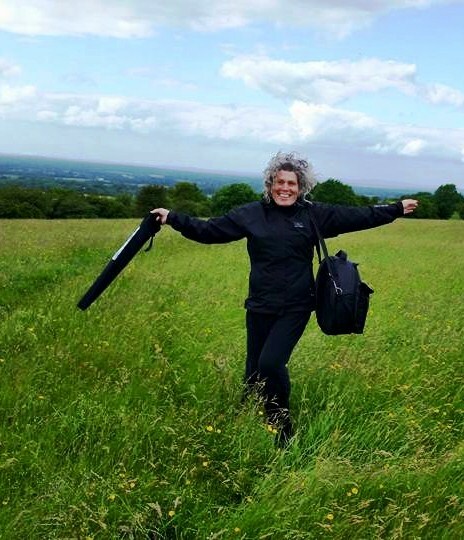 I’ve just returned from a pilgrimage to some of Ireland’s early sacred sites, travelling with a coterie of amazing women whose companionship proved invaluable in enhancing profound interactions with the wells, cairns, barrows, henges, mounds and temples of our ancestors. Shared knowledge, stories, memories, visions and dreams enhanced our individual insights and experiences and resulted in a deep sense of reverence for the land we walked upon. Our guide, Amantha Murphy walked straight out of the tradition of the beloved down-to Earth magical women of my childhood – Mrs. Piggle-Wiggle, Mary Poppins, and Mrs. Doasyouwouldbedoneby (If you have never read about them, hie you to the library immediately. Like most enduring children’s literature, these well-written and engaging stories transmit ethical and mystic information as meaningful to adults as children.) As a child, I believed completely in the reality of these fierce and lovable characters and they remain very real guides and mentors in my heart and mind to this very day. Imagine my delight to meet a flesh and blood representative of their ilk. Amantha, in the best fairy godmother tradition, is a small round woman draped in flowing shawls and skirts put together in a delightful mix of colors, patterns and textures. She walks with a cane, striding at a calm steady pace across grasslands, over boulders, up steep hills and down into underground crannies. Her patience should be legendary and derives from the deep inner calm only available to those who truly know and accept themselves. I’ve never met a more accommodating tour leader for catering to the needs and foibles of her charges. At the same time she kept a firm capable hand on the group, staying on schedule, herding us from place skillfully and professionally as any sheep dog, with never a harsh word or admonition. 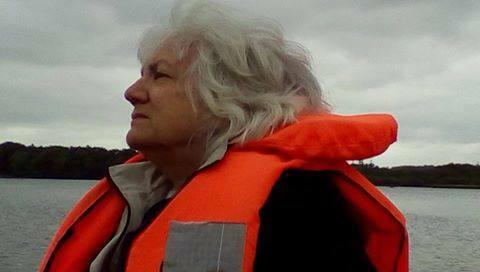 Her knowledge of the sites, history, stories and legends of ancient Éire complements by her talent her work as a shamanic healer and medium. Her extensive experince in facilitating women’s circle groups enriched our gatherings and allowed each woman space to speak freely and personally. 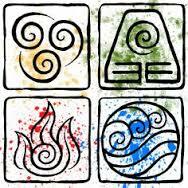 Water, Earth, Air Fire – elements that form the basis of every earth-based spiritual practice. We woke to them, dreamed of them, lived in consciousness of them. In Ireland, a land surrounded by water, the people continue to venerate the sea, their rivers and the the many springs that bubble blessings upon the land. 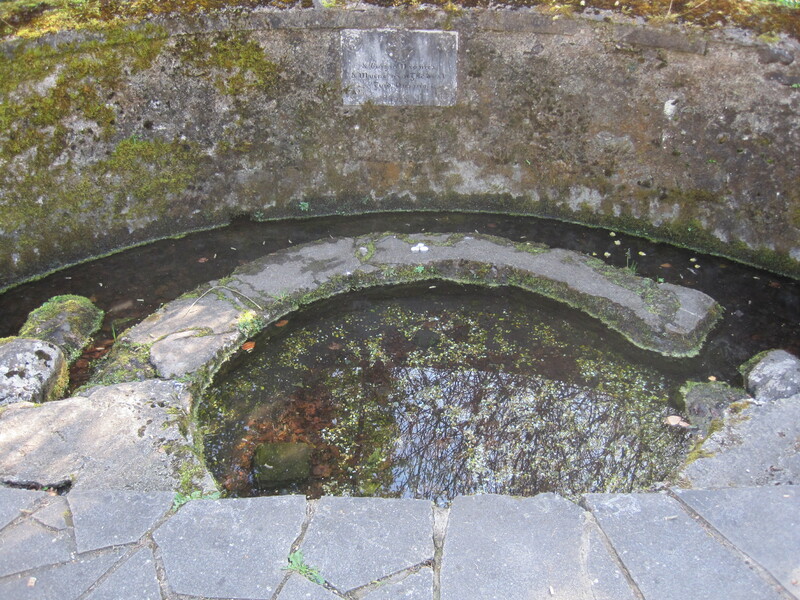 Many of the springs have, since ancient times, been protected by walls and coverings. These wells are still in use and many belong to Brigit, venerable goddess turned saint. 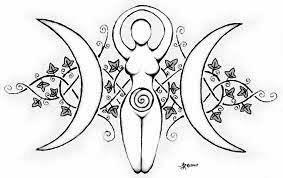 As a poet, Brigit is a goddess I am very familiar with. She travels beside me to every reading, helps me breathe, relieves me of stage fright and adds resonance to the words I speak. Brigit is one of the few deities of old to make a successful transition into the modern world. 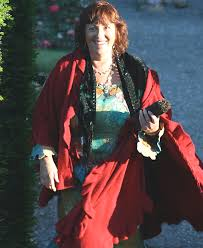 She slipped gracefully from Paganism to Christianity without losing her connection to the people of Ireland and continues to offer her devotees healing, hope and inspiration. It was a joy to kneel at her holy wells and drink from fountains that have continued to flow unceasingly for millennia. One of the joys Amantha brought to our pilgrimage was her ability to create simple appropriate ceremony on the spot. She is adept at incorporating new circumstances, recent conversations, and changing mood or weather into a ritual perfect for whatever place and time we were in at the moment. The lack of cant or dogma from both Amantha and the group was one of the great delights of this trip. As was our dear Rose, driver par excellence, purveyor of necessities and luxuries, reverent drummer and sweetest of companions. The trip would not have been as easy or joyous without her. There were so many highlights, all so meaningful I don’t want to list them as if this were a brochure. The experiences are too recent for me to want to fix them into words as yet. But I want to get share the flavor of our journey so I will describe the island of Innisfallen. 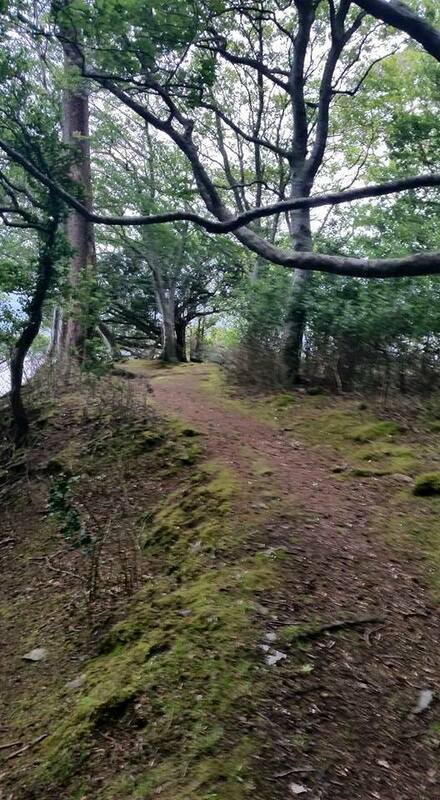 Inis Faithlinn (Innisfallen) lies low in the waters of Lough Leane. I won’t start on the legends and history of the lake because they are all connected and intertwined in a Celtic knot impossible to unravel in the space allotted to this essay. Suffice it to say that the lake is magical and deep and spans not only the centuries, but the realms of this and other worlds. 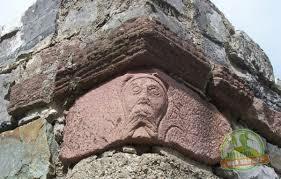 It belongs a much to the Tuatha Dé Danann as to our contemporary world. In is Faithlinn holds the remains of a monastery founded in 640 CE, but long before then it was home to the holy folk of much older religions. I’ve rarely visited a place that felt so welcoming. We twelve arrived in a shallow boat that barely held us all and sat just inches above choppy lake waters. Our ferryman was an old acquaintance of Amantha’s. 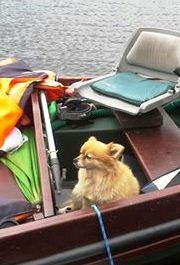 He and his little dog Bella took good care of us as we journeyed across the water. I kept thing of the Ryder Waite tarot card- the six of swords. To me this card indicates transition – moving from something old to something new with a sense of accompanying poignancy and memory. The ruins of the monastery lie beside an ancient yew tree on a lovely grassy meadow. A dirt path meanders around the island skirting an interior covered in woods and meadows full of blooming foxgloves. The wind soughed and murmured in the trees like half-heard conversations for our entire visit. 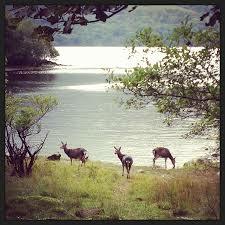 Small herds of deer grazed among the trees and white swans sailed just beyond the shoreline. I found a clutch of hatched duck eggs under a mossy tree. The island felt surprisingly familiar to me, as if I’d been there many times before – sometimes as a woman, sometimes as a man. By now, it’s history has been washed clean by sun, wind and rain. Those long ago events felt present to me, but transparent somehow. Lingering, not because they are bound to this place, but because Inis Faithlinn feels as good to whatever ghosts might be as it does to me. The wind and the land were present throughout my journey as elemental entities palpably guiding, touching, inspiring, comforting and loving me. I am forever grateful to the Irish deities, the weather, Ireland, Amantha and the remarkable women who accompanied me for a deep and abiding encounter. Blessed be each and every one of you. 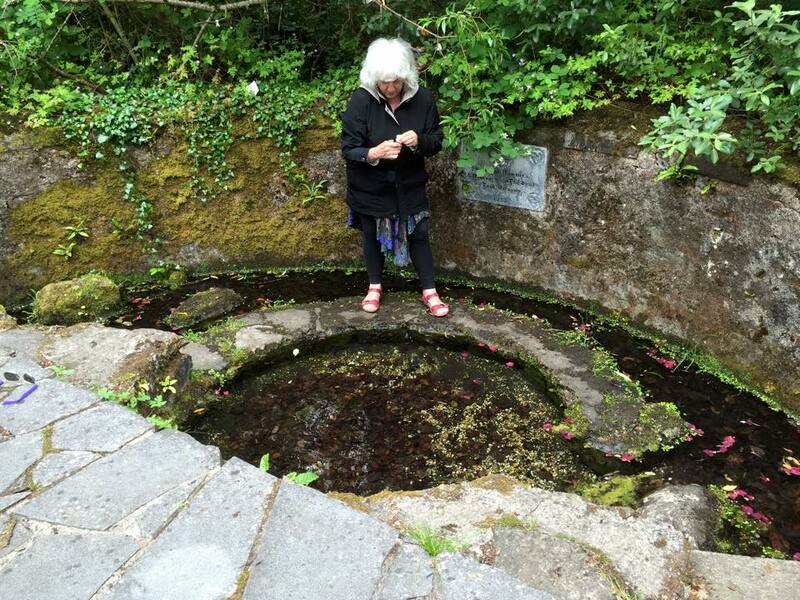 This entry was posted in Circle, Community, Consciousness, Gratitude, Meaning, Myth, Women and tagged Amantha Murphy, Brigit, Inis Faithlinn, Ireland, Priestess Pilgrimage, ritual, sacred wells, spiritual practice. Bookmark the permalink. Chris, Thank you for sharing your journey. It sounds magical, deeply touching and quite wonderful..